Time to think about GRADUATION Quilts! Get your order in now. T-shirts are personal. They're old friends. They tell a story. Special events, memorable times for you, or the life of someone you love. Give your t-shirts new life by creating a one-of-a-kind t-shirt quilt. Making a T-Shirt quilt is a creative way to transform those shirts (or laundry) into a legacy! Let us create a lasting heirloom from your treasured T-shirts. T-Shirt Quilts of Texas is the largest t-shirt quilt business in Texas, and one of the largest in the U.S.A. Trust your shirts to the best! Wrap yourself in the memory of one who has passed. When a parent or grandparent has passed, who feels it the most? Kids and grandkids have a special bond. A custom quilt made from the clothing can be a special 'hug' from those who are not here any longer. Don't forget to have one made for YOU. 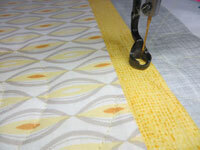 Whether it is your first quilt, heirloom quilt or t-shirt quilt top, we can finish it for you. TIME TO GET YOUR ORDERS IN FOR GRADUATION. What sets us apart from other t-shirt quilt makers? Quality is the most important thing for both T-Shirt Quilts of Texas and Shadywood Quilts. We use 100% quilter's quality cotton fabrics for all sashing, borders and backing fabrics. All t-shirts are backed with a light-weight woven fusible 100% cotton interfacing to help stabilize the t-shirt fabric. All quilts are professionally machine quilted using the latest technology in computerized quilting systems. All quilts are quilted for durability. NOT hand-tied. We only use the highest quality blended cotton/poly batting for extra softness. Prices are all inclusive to ensure that you always get the best quality for YOUR treasured heirloom. Need Your T-Shirt Quilt FAST? For a small fee we can rush your quilt through the process. The tshirts should be uncut. We can do minor repairs. Tshirts must be clean and odor-free. 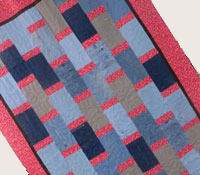 All quilt orders require a $100 non-refundable deposit.